Often imitated, but never duplicated, the Sportsman is unmatched in its class and has been our best-selling boat for more than a decade. It’s hard to believe that a hull this rugged can have a bow this sleek and outstanding fuel economy to boot—but that’s exactly why the Sportsman is so popular. Plus, it’s small enough to launch on your own and safe enough for the whole family to enjoy. If you’re looking for a great value, or a boat to pass on to your kids, this is where you start. We’ve learned that the best way for your family to enjoy the lakes and rivers of the Pacific Northwest is to leave your worries behind. That’s exactly why we created the Sportsman. Offering a combination of strength, safety, economy, and ease-of-use that no boat in its class can match, the Sportsman doesn’t cut corners. 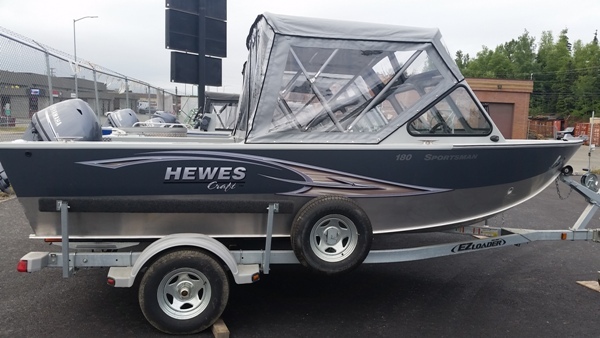 Instead, it delivers the proven strength of our all-welded aluminum construction with a design that’s light enough to be quick on the water and very easy to tow. 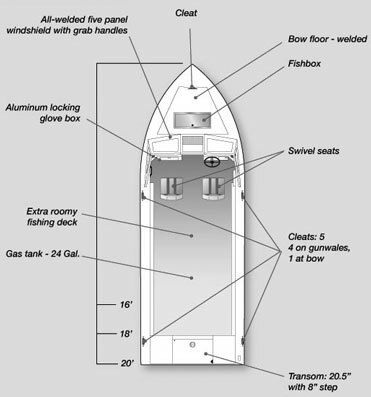 And with its gunwale flotation system and high sides, the Sportsman is also light on concerns. That’ s something every family loves. 18' Sportsman Yamaha F50 4-Stroke Spec. EZ Loader Trailer Spec. Beam 86" 60.8CI Weight 649 lbs.